Alaska Air Group plans 8% capacity growth in 2015, which is lower than the roughly 10% rise the airline will post in 2015, but higher than the industry average. Higher than average capacity growth has been the norm at Alaska Air during the last five years. The company finds itself constantly defending its expansion, pitting that growth against consistent profitability and an expansion of top line revenue. Alaska Air believes 4% to 8% capacity growth is the ideal range for its business, and using that growth profile baseline, concludes it can generate annual increases in revenue of 3% to 8%. One new revenue stream Alaska is adopting in the short term is the creation of a premium economy product, a trend that has swept much of the US industry. As Alaska Air looks to increase the amount of revenue generated within the aircraft cabin, revenues from the company’s partnerships have diminished. But the company has made up for the shortfall by increasing its own branded revenue, driven by Alaska’s solid network expansion during the last few years. Originally, Alaska Air had planned 8% capacity growth in 2015, but the target eventually grew to 10%. The company opted to push back some lease returns of older Boeing 737-400s to take advantage of inexpensive lift in markets it concluded warranted extra capacity. Alaska Air finds itself in the position of constantly stressing to investors that its growth is accretive to the bottom line. To illustrate its conclusion, Alaska recently told investors it has actually grown above the industry average for the last 20 years. During the last five years through YE2015 its average annual growth rate has reached 7.6% while the US industry average was 1.8%. However, during the five year period between 2005 and 2010 its annual revenue has grown from USD3.8 billion to USD5.6 billion (estimated for 2015). Its net income has increased from USD262 million to USD800 million. Even with the significant growth Alaska has undertaken during the last few years, its overall presence in the US market remains small. For the week of 7-Dec-2015 to 13-Dec-2015 Alaska represents just 3% of the system wide US ASMs. Between 2012, when Delta launched an aggressive build up in Seattle, and 2015, Alaska Air’s net income jumped 158% from USD340 million to USD880 million. During that time Delta’s seat share in Seattle has grown from 11% to 20%. Alaska, meanwhile has maintained a 51% seat share during that time at its largest hub. United has posted the greatest decline in departures from 43 to 29, a decrease of 32%. Recently Alaska Air chief commercial officer Andrew Harrison remarked that between 2012 and Dec-2015 Seattle’s daily seat deployment jumped 25% from 53,000 to 66,000, and the carrier still maintained its seat share. However, even as Alaska has grown its profits during Delta’s incursion and maintained its seat share in Seattle, the added capacity from Delta’s direct competition on many of Alaska’s routes has pressured Alaska’s passenger unit revenues, which for the 9M ending Sep-2015 fell 5%. Some larger US network airlines have stated that their unit revenues could start a positive trajectory starting in 2H2016, but Alaska has not offered similar guidance. Alaska is facing further competitive capacity pressure in 1H2016. During 1Q2016 it expects a 15% rise in competitive capacity and 8% growth in 2Q2016. Roughly 40% of the incremental competitive ASMs are driven by annualisation of new route introductions by its competitors in 2H2015. 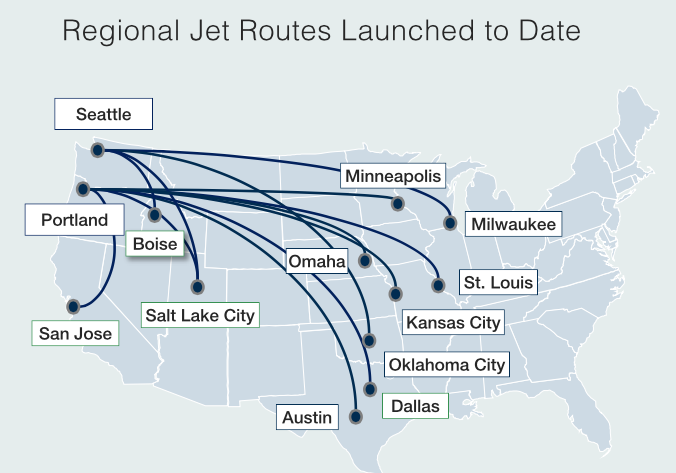 Although Alaska Air has made its own capacity push from Seattle as Delta has amped up competition, many of the route additions are in markets that have no direct, or little service from the airport. Among the new uncontested routes it has introduced from Seattle during the last couple of years include Raleigh-Durham, Charleston, Nashville and BWI. The latter two markets are generally operated on a seasonal basis by Southwest. Using BWI as an example of a market that spools up quickly, Mr Harrison remarked Baltimore was a market that lacked year round service prior to Alaska’s 2014 launch. Since the introduction of service, Alaska has recorded load factors greater that 85% and grown passenger numbers in the market. In 2015 Alaska has introduced seven Embraer 175 into its fleet operated by partner SkyWest Airlines. Its strategy with those regional jets is to place the aircraft on routes with a range that exceeds the Bombardier Q400 turboprops operated by Horizon, but are too thin for mainline Boeing 737 narrowbodies. It also allows Alaska frequency flexibility during off-peak times. Most of the aircraft are deployed from its Seattle hub. The airline has estimated that with a steady state operation of seven aircraft, its Embraer 175 service should generate annual revenue in excess USD130 million. Alaska projects the number of E175s in service will grow to 16 by YE2016. Alaska has joined nearly every major US airline in creating a premium economy (added legroom) section onboard its aircraft to better monetise revenue within the aircraft cabin. It plans to reconfigure its 737-800s and -900ERs with 30 and 24 premium economy seats, respectively. It also plans to offer a premium economy product on the E175s. First class seats on the -800s will drop by four, but pitch on those seats will increase. Regular economy seats will decrease by 30 for a total seat count after reconfiguration of 159 versus a current count of 163 (after a recent seat densification project). On the -900ERs, the economy section will lose 27 seats to accommodate the new premium economy product for a total seat count of 178 compared to a current configuration of 181 seats. Premium economy is an interesting move by Alaska, which finished its seat densification project in 2014, and touted the incremental revenue benefits of the move, which was estimated at an annual run rate of USD50 million. Alaska estimates the addition of premium economy should add more than USD85 million in annual profit by 2018 when the aircraft reconfigurations to remove seats are complete. It also concludes that despite the changes, its average aircraft gauge will grow by 5% by 2018 due to fleet mix changes. Alaska expects to retire its Boeing 737-400 fleet, which includes 21 passenger jets configured with 144 seats, in 2017. 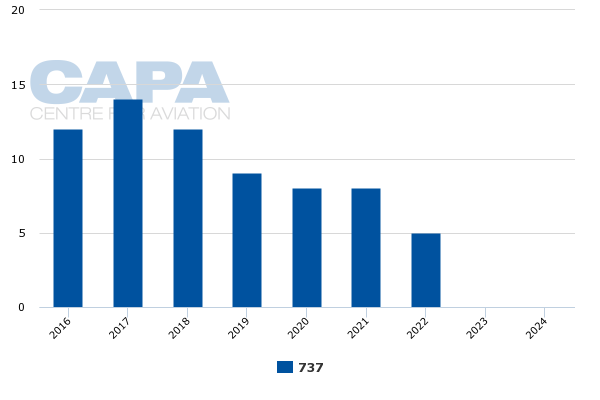 As of 13-Dec-2015, CAPA’s Fleet Database shows that Alaska has 31 higher density 737-900ERs on order and 37 Boeing 737 Max jets that are scheduled for delivery starting in 2018. Firm orders include those placed directly by the operator and by lessors assigned to the operator, from 7-Dec-2015 onwards. One of the by-products of Delta’s build up in Seattle to feed its growing international network is a diminished codeshare with Alaska. Delta is adding numerous domestic flights to feed its international long haul destinations, and opting to significantly cut its reliance on Alaska for feed. Alaska’s total partnership revenue (codeshare, domestic interline and international interline) is falling year on year in 2015 from USD652 million to USD542 million. Its revenue from the Delta codeshare dropped from USD190 million to USD94 million. Its domestic interline revenue is growing from USD113 million to USD116 million, which helped in part compensate for the drop in international interline revenue from USD53 million to 49 million. 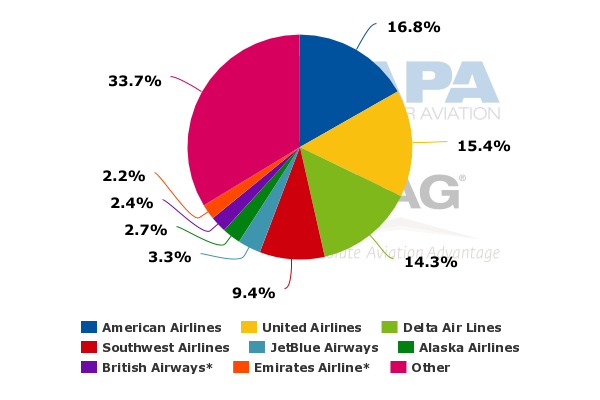 Alaska’s codeshare revenue from American is growing slightly from USD223 million to USD225 million. Now that American’s complex passenger system cutover is complete, Alaska Air in 2016 should grow its codeshare revenue with American. Even as its partnership revenue has dropped, Alaska’s revenue from its own sales is growing from roughly USD4.7 billion in 2014 to USD4.9 billion in 2015. That also allows the company to compensate for lost partnership revenue. Mr Harrison remarked that as Alaska expands with its own brand, the reliance to connect over other airlines’ hubs diminishes. He remarked that Alaska’s partnership revenue is “where it needs to be”. Alaska Air Group is projecting an increase in net income year on year in 2015 from USD572 million to USD800 million, anticipates growth in pre-tax margins from 17.2% to 22.8% and expects to exceed the USD600 million in rewards it will deliver to shareholders in 2015 during 2016. The market appears to have taken notice of Alaska’s strong underlying fundamentals. Its stock price as of early Dec-2015 have grown from roughly USD55.19 to USD83.51 year on year. There may be some lingering questions by investors if Alaska is equipped to handle challenges that crop up during any given business cycle. But it has arguably weathered one of its largest obstacles to date during the last three years as Delta has placed unprecedented pressure on Alaska. That obviously lends huge credibility to Alaska’s staying power.